Essentially, Dr. Seuss was the editorial cartoonist for a New York political magazine called PM, for two years from 1941 to 1943. In that time, he was incredibly prolific, and wrote/drew over 400 cartoons. 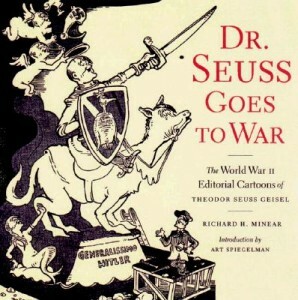 One thing I took away from this book was the evidence that Dr. Seuss was unfortunately, not immune to the plague of racism that he himself rallied so strongly against. His treatment of the Japanese, even before the bombing of Pearl Harbor was pretty despicable, (although some might argue justified given the circumstances, I would tend to disagree). However, to his credit, and at least partial redemption in my eyes, he actually visited Japan in 1953, and subsequently wrote Horton Hears a Who. This book is a must read for fans of Dr. Seuss, and I think it’s also a very handy history lesson (from the perspective of someone who has never successfully completed an American History course). If you want to just read the cartoons, or supplement the book material, the University of California San Diego’s website hosts an awesome archive of all 400 of Dr. Seuss’s political cartoons. (Only 200 are reprinted in the book.) I wish they’d been scanned (or made available) at a higher resolution, since the details really are what makes this work stand out, but nonetheless it’s an awesome archive of an absolute master of the art.